Two of my favorite marginalia examples from my local rare book library show annotators doing unexpected things with books, both very much in the spirit of Leah Price’s innovative approach to the topic. In one example (below), an English translation of a French drawing manual, published in 1777, an unknown annotator has drawn a musical staff with a melody and numbers representing intervals in a D-major scale. Musical marginalia in a copy of Gerrard de Lairesse, The Principles of Design for the Curious Young Gentlemen and Ladies (London, 1777). Image courtesy of the Thomas Fisher Rare Book Library, University of Toronto, call no. B-13 03651. Entries from Samuel Maude’s diary, written in the margins of Samuel Johnson, The Plan of a Dictionary of the English Language (London, 1747). Image courtesy of the Thomas Fisher Rare Book Library, University of Toronto, call no. E-10 01333. 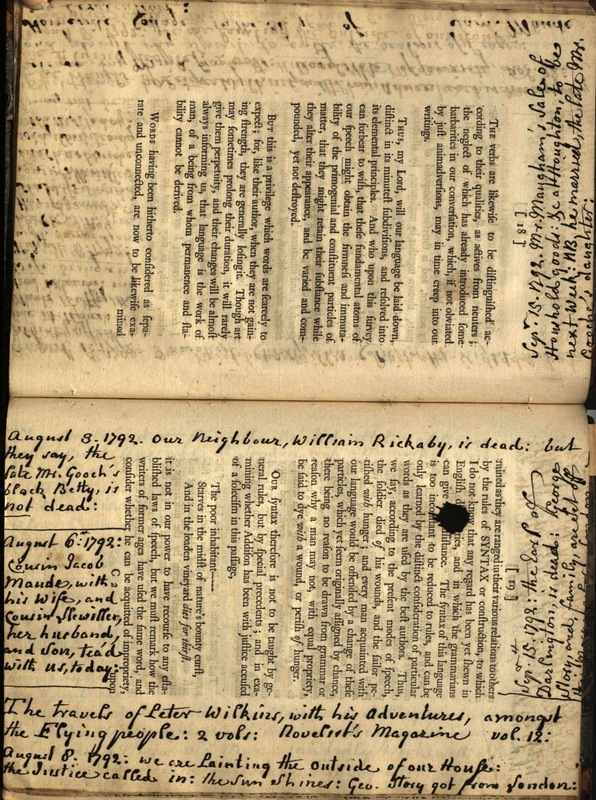 In the other example (right), one Samuel Maude apparently decided in the summer of 1792 to keep a diary in the margins of a 1747 copy of Samuel Johnson’s Plan of a Dictionary of the English Language. You can see how Maude used his limited writing space economically, winding his entries around pages and leaping over gutters like a hurried graduate signing a high school yearbook. Yet the experience of reading Maude’s diary all the way through is surprisingly natural, provided you doesn’t get distracted by Johnson’s text, and are willing to keep rotating the book as you turn the leaves. H.J. Jackson has described the marginalia of annotating readers as a “contested goldmine” for scholars looking for evidence of reading environments and readers’ experiences of texts—”contested” because marginalia aren’t always the windows into readers’ minds they might appear to be. What I like about these two marginalia examples is that neither annotator seems interested in the printed texts of the books. Rather, they used these books for their basic material qualities as ready-to-hand writing surfaces. The musical annotator clearly found an aptly shaped blank page in the writing manual, whose oblong octavo format suits musical notation, just as it suited the book’s content when printed in 1777. The diarist Samuel Maude’s thinking, by contrast, is less easy to reconstruct. Instead of purchasing one of the numerous ruled blank-books that made up a good chunk of the book trade in the eighteenth century, he selected a thin printed book that was already 45 years old, and contorted his entries into limited space, while sometimes leaving other margins unfilled. Studies of marginalia almost always focus on notes that comment upon the texts at hand, as evidence of reading, but Leah Price calls us to think about unreaderly uses for books, like Maud’s, and their implications for cultural history and reception studies. Perhaps Maude was simply cheap. Or perhaps he thought about paper differently than we do, given the intervening industrialization of paper-making, typesetting, and mass-printing in the nineteenth and twentieth centuries. Looking today at Maude’s diary as a kind of artifact, how should we understand the relationship between the person and the object as it developed over the summer of 1792? What was he to this book, or this book to him? For Maude and the musical annotator alike, codex books were objects with printed leaves made of paper, but how were the eighteenth-century books in their hands different objects than the copy of Price’s book I held in my own hands while reading? How has the act of reading changed—or, more in keeping with Price’s approach, how has the spectrum of book-handling changed—between then and now? This understanding of print is a far cry from the abstractions of literary history, from the chronicling tendencies of older print-culture studies, and from the idealized literary reading invoked by those who seek refuge from the present in an imagined past. Price is part of a generation of book historians that recognizes that although we must tell the stories of the objects and the technologies that produced and circulated them, we also must also seek the stories of the hands that held them. Johnson’s dictionary in flight, from a plate titled “Rebecca’s Farewell,” William Thackeray, Vanity Fair (London, 1848), facing p. 7. Image courtesy of the Thomas Fisher Rare Book Library, University of Toronto, call no. B-10 04650. Those hands didn’t just hold books, as Price’s broad account shows, because books are never just things: they are also sites where various activities converge and sometimes collide, including reading, writing, selling, lending, borrowing, losing, stealing, defacing, censoring, concealing, cutting and pasting, pressing (often flowers and locks of hair), folding, and flinging. On this last form of use, think of Vanity Fair’s opening chapter, in which a copy of Johnson’s dictionary becomes a backward-flung projectile as Becky Sharp goes forth into the world. Detritus or diary: neither fate is likely what Doctor Johnson imagined for his books—but, as Price argues, that’s the point. 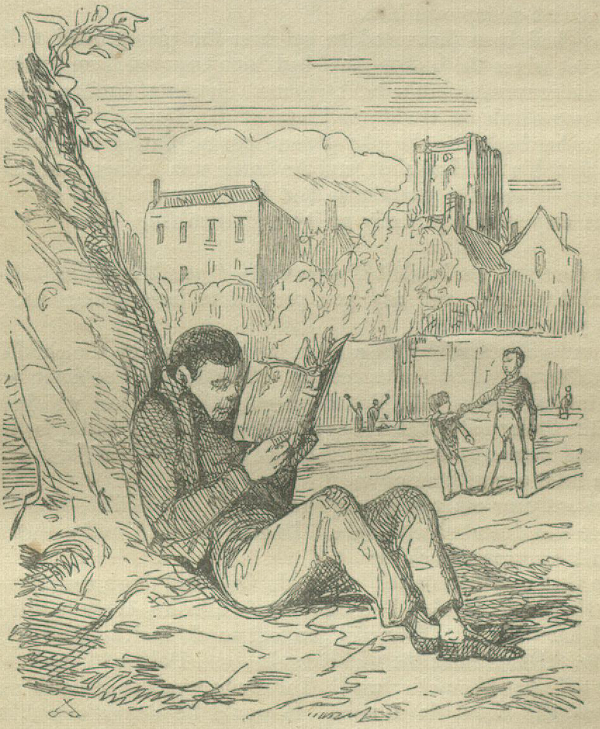 Dobbin reads the Arabian Nights instead of playing sports with his schoolmates in Vanity Fair (London, 1848), p. 35. Image courtesy of the Thomas Fisher Rare Book Library, University of Toronto, call no. B-10 04650. Many scholars have been just as ready to essentialize reading in terms of the novel, and Price rightly asks “why have book historians drawn a disproportionate number of their case studies from the realist novel?” (221). But the problem runs deeper than mere selection bias, according to Price: “Even when book historians choose examples that happen to fall outside the literary canon, the language in which they describe their own scholarly practices remains parasitic on those novels and memoirs that thematize reading” (107). Genres such as the bildungsroman have “both generated and limited the stories scholars tell about reading” (107), such that any study of reading risks a long-running tautology: supposedly the act of reading fulfills the book’s function as an object, and we know what reading is because it’s the essential act called forth by the book. Countless characters in Victorian novels make this tautology look natural whenever they step into a library or attic and, by reading, discover themselves to be the heroes of their own lives. Can the history of reading in the modern era become something more than a footnote to David Copperfield? Price clearly thinks it can. The seven chapters, plus introduction and brief conclusion, that comprise How to Do Things With Books collectively take up the challenge of studying books “without privileging reading” (20). Following the substantial introduction is a general first chapter on “Reader’s Block,” which outlines the problems that studying reading presents for book history, as I’ve mentioned already. Paired case studies follow in Chapters 2 and 3, titled respectively “Anthony Trollope and the Repellant Book” and “David Copperfield and the Absorbent Book” (both written in full awareness of the irony, in this context, of beginning with author-centric chapters about canonical literature; see p. 36). Chapter four, “It-Narrative and the Book as Agent,” introduces a twist by examining the fictionalized stories that books tell about themselves, in their own voices, in the genre of the it-narrative (a broad genre that also includes imaginary autobiographies told by snuffboxes, banknotes, and other objects that circulate among rich and poor owners alike). The social dynamics of circulating reading material remains a theme through the rest of the book, including chapter five, “The Book as Burden: Junk Mail and Religious Tracts,” and chapter six, “The Book as Go-Between: Domestic Servants and Forced Reading.” Both demonstrate the value of looking for reading in all the wrong places, so to speak, such as among domestic servants, who handled books and newspapers not their own, and among the pamphlets and tracts that contributed to a Victorian sense of print overload. 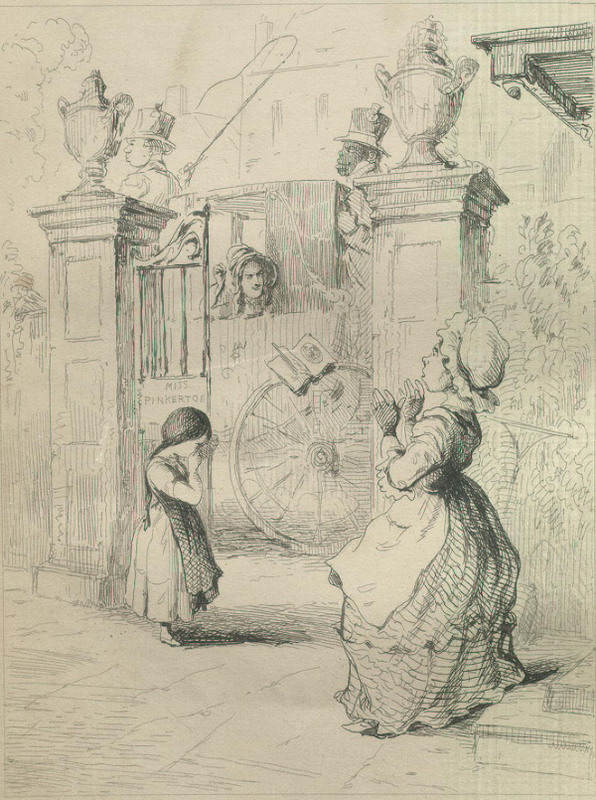 A street-stationer in Henry Mayhew, London Labour and the London Poor, vol. 1 (London, 1851), facing p. 296. Image courtesy of the Internet Archive. 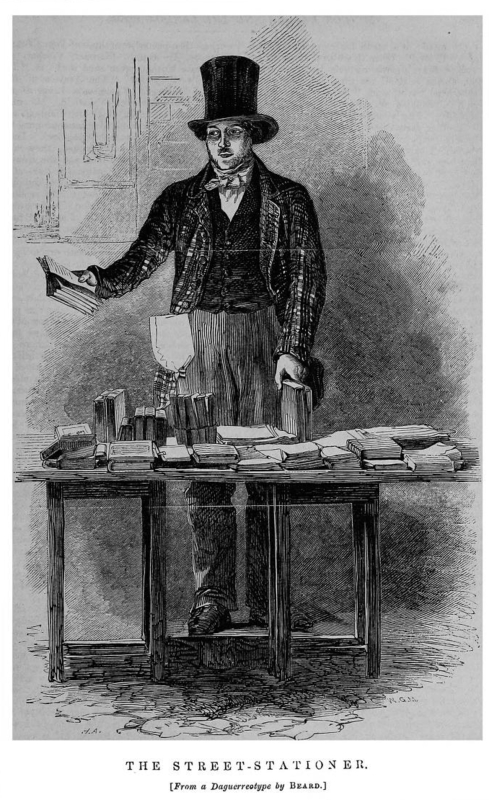 The final chapter, one of the strongest, is called “The Book as Waste: Henry Mayhew and the Fall of Paper Recycling.” In its sustained look at subject of paper in Mayhew’s London Labour and the London Poor (serialized between 1849 and 1852, and published as volumes in 1861–1862), it displays a consistency of focus that’s occasionally lacking in other chapters, in which rapid-fire examples can fly past a bit too quickly. But if Price’s lines of thought seem at times to jump unexpectedly, especially in the earlier chapters, it’s only because she’s following complex connections among her materials, and isn’t simply re-telling the traditional narratives spun by reception scholars, book historians, and cultural historians. The Mayhew chapter marks this distinction well, particularly in Price’s analysis of the way London Labour’s descriptions of paper recycling add up to challenge the reader’s understanding of the object in her hands, and to recognize the pages of any copy of London Labour as likely being destined for fish-wrapping or some other unreaderly—but nonetheless bookish—fate. Mayhew’s understanding of materiality, argues Price, “reverses the logic that we tend to take for granted in the history of the Victorian novel, where a single text cuts across different media as its plot migrates fluidly from monthly numbers to library-issue triple-decker to cheap reprint to an equally varied series of theatrical adaptations” (239, emphasis in original; compare the form of the novel represented in the Thackeray illustration below). How to Do Things With Books will be of obvious interest to book historians, but also to scholars in literary studies, history (especially economic history), and communications studies, and to non-specialist readers interested in the social and material worlds of Victorian literature. Price makes an especially valuable intervention in book history by arguing—and repeatedly demonstrating—that the history of books and the history of reading are not the same thing. As Price suggests, the ease with which the histories of books and reading can be conjoined has “blinded us to the possibility that those two histories are distinct and even competing projects” (131; see also p. 34). This is a sobering thought for book historians. Indeed, her book is as much a methodological and disciplinary meditation as it is an historical study. For example, in Price’s chapter on “It-Narrative and the Book as Agent” (another of the strongest ones), she draws striking parallels between Victorian literary genres and the different fields of study that come to bear upon them today, with modern reception studies anticipated by “the post-Romantic psychologizing of the bildungsroman (David Copperfield and Jane Eyre),” and with analytical bibliography anticipated by the it-narrative (131; to the latter analogy one might add the Victorian detective fiction that was so admired by early twentieth-century bibliographers, especially W.W. Greg). The lowest species of reader: a book-reviewer. 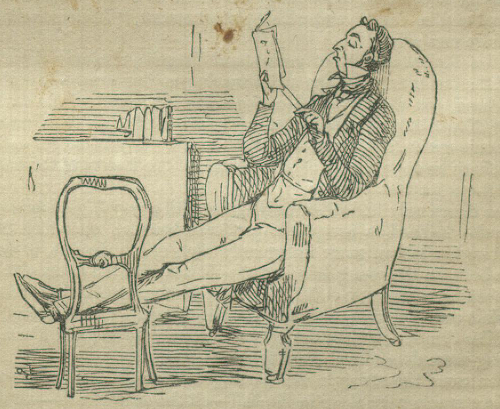 Thackeray imagines an annotating reader of his own novel in Vanity Fair (London, 1848), p. 5. Note the format, a monthly serial part rather than a single volume or triple-decker. Image courtesy of the Thomas Fisher Rare Book Library, University of Toronto, call no. B-10 04650.
the moment we are required to explain the signs in a book, as distinct from describing or copying them, they assume a symbolic status. If a medium in any sense effects a message, then bibliography cannot exclude from its own proper concerns the relation between form, function, and symbolic meaning. Price, like McKenzie and most of the scholars one might encounter at a SHARP or STS conference, reads the books she studies, and she puts those interpretive readings to work brilliantly. Yet in her handling of the evidence question in How to Do Things With Books, Price’s stated strategy sounds oddly like Greg from 1932, setting aside the empirical where Greg sets aside the literary, but setting it aside nonetheless. Price takes a less categorical tone, and to her credit and Greg’s neither of them follow their own precepts rigidly, but the gesture of bracketing evidence of any kind is questionable. How then should a strongly reception-focused study like How to Do Things With Books position itself in a field where literary studies, cultural history, and book history increasingly cross-pollinate, and in which different kinds of evidence increasingly jostle within the same studies? 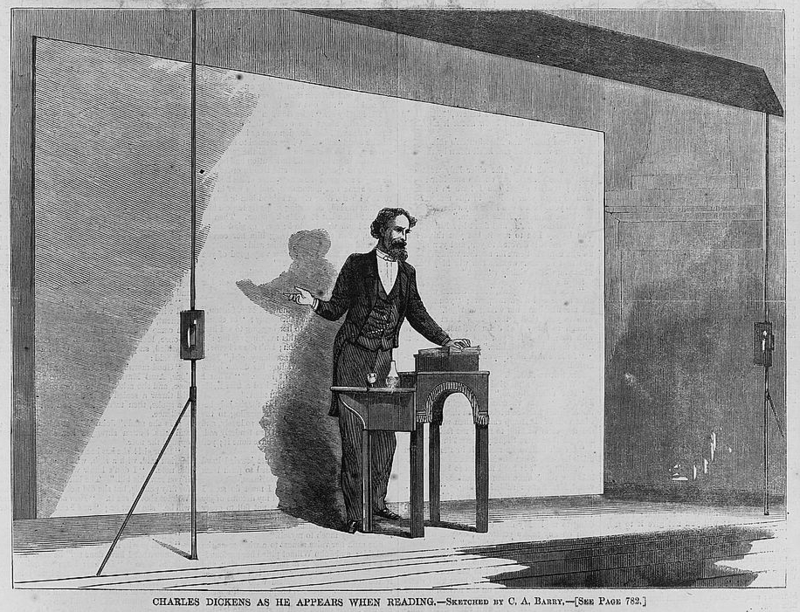 Charles Dickens gives a public reading, as pictured in Harper’s Weekly, vol. 11, no. 571 (7 December 1867). Image courtesy of the Library of Congress. Representations matter, and they’re at work in the bibliographic imagination even when we attempt to bracket them: there is no refuge in narrow positivism (not that many serious bibliographers or book historians seek it these days, though the separate field of literary history is another matter). Yet Price also identifies a comparable danger on the other side when she singles out “thematic materialism,” as she terms it: “the danger is a typological interpretation that reduces the text to an allegory of its own manufacture … In this kind of reading, a history of the material conditions of production and consumption can either redundantly corroborate some formal or thematic explication of the text itself, or irrelevantly contradict it” (130). In other words, it is not enough merely to trawl through works like David Copperfield and point out instances where the text calls attention to its own materiality. In making this argument, Price echoes Johanna Drucker and others who’ve recently critiqued textual-materialist approaches from within, and call for it to do more than merely catalogue forms of textual materiality. 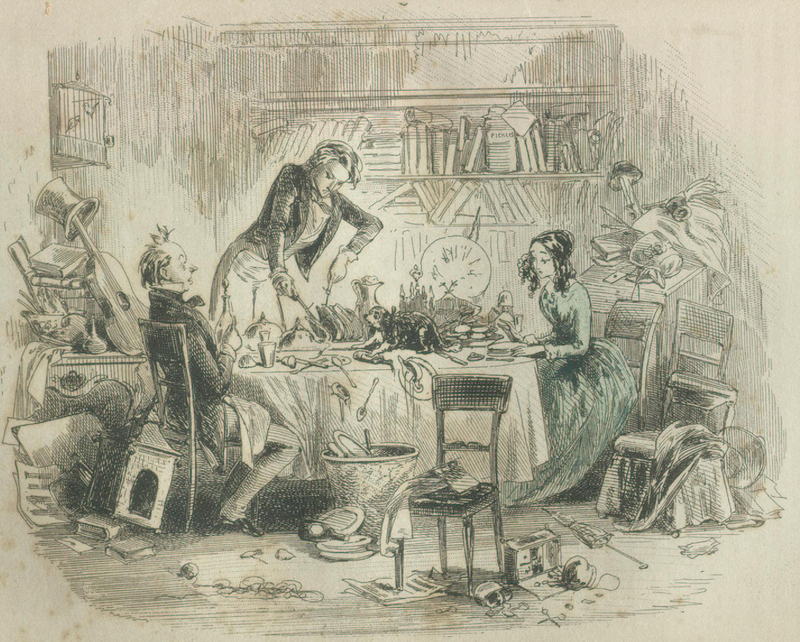 Books shelved alongside a pickle jar in a plate titled “Our Housekeeping” from David Copperfield (London, 1850), facing p. 454. Image courtesy of the Thomas Fisher Rare Book Library, University of Toronto, call no. D-10 01181. On this illustration, see Price p. 99. Evidence of a book’s social afterlife: layered marks of ownership, both individual and institutional, from the title page of the Fisher copy (see image above). The challenge that Price’s book leaves us with, then, is to find the right middle ground between the evidence of material culture, on the one hand, and the power of the cultural imagination, on the other. Much of the field of book history shares this challenge, whether it knows it or not, and Price’s book adds to the debates about evidence for reading that have been raised by projects such as the Reading Experience Database. Many of those debates come down to a single crux: just as the history of books and reading are not collapsible into each other, neither are the stories we tell (and read) about reading always reconcilable with the stories that books, as artifacts, may tell about their own uses. 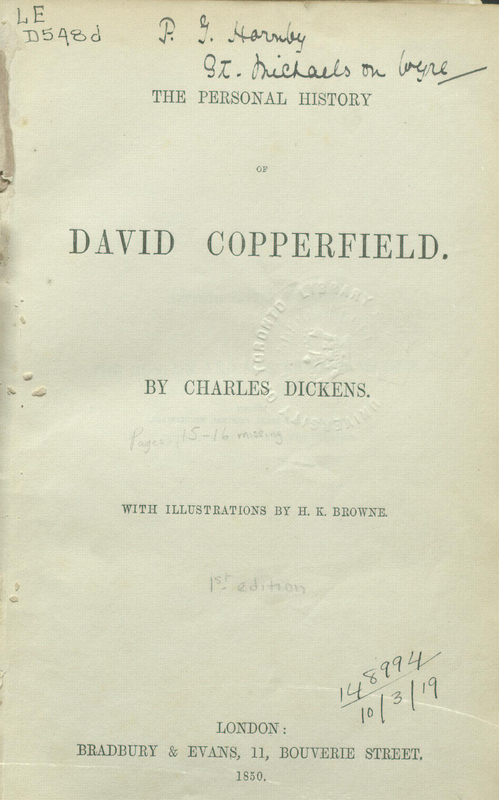 To study reading and book-handling in David Copperfield is not interchangeable with studying the reading and handling of David Copperfield, but I cannot imagine allocating those questions to different fields, or keeping those kinds of evidence apart in the same study. Indeed, Price’s own book is at its best when she considers the circulation of books in acts both real and imagined. Price’s book may not perfectly negotiate the evidential and methodological dilemmas that stand between reception studies and book history, but that’s no failing; rather, Price advances the question overall by deepening and complicating our understanding of what reading (and not-reading) means in relation to printed matter. How to Do Things With Books is a book about not-reading that deserves to be widely read among book historians and literary scholars alike. This book also sets up its own sequel, and I look forward to Price’s upcoming People of the Book: How Understanding the Printed Past Can Transform Our Digital Future (in preparation; a prospectus is available via the link). As Price argues in the present book, “when we use idealized printed texts as a stick with which to beat real digital ones, we flatten the range of uses to which the book was put before digital media came along to compete with it” (7). That premise is true of book history in general, but Price also shows convincingly that “we can learn, in particular, from the Victorians’ struggle to articulate how far the power of books (for good and evil) depended on their verbal content, their material form, or the social and antisocial practices that they enabled and even prompted” (7). As scholars such as Price bring a much-needed historical perspective to discussions of digital reading, it’s both humbling and reassuring to realize that we’re still discovering how to do things with books, past and present. H.J. Jackson, Marginalia: Readers Writing in Books (New Haven: Yale University Press, 2001), p. 6. Some studies that are similar in spirit to Price’s, even if different in subject, include Janice Radway, Reading the Romance: Women, Patriarchy, and Popular Literature (Chapel Hill, NC: University of North Carolina Press, 1984), H.J. Jackson, Marginalia (cited above), William St Clair, The Reading Nation in the Romantic Period (Cambridge, 2004), and William H. Sherman, Used Books: Marking Readers in Renaissance England (Philadelphia: University of Pennsylvania Press, 2008). This last title might seem like an odd touchstone for a book about Victorian Britain, but Price uses Sherman’s work, along with Natalie Zemon Davis’s work on books in early modern France, in ways that show the value of cross-period thinking about critical method. The touchstone passage in David Copperfied for the history of reading occurs in chapter 4, when the chastized young David discovers his father’s trove of books in an upstairs room: “from that blessed little room, Roderick Random, Perigrine Pickle, Humphrey Clinker, Tom Jones, The Vicar of Wakefield, Don Quixote, Gil Blas, and Robinson Crusoe, came out, a glorious host, too keep me company”; Charles Dickens, David Copperfield (Oxford University Press, 1999), p. 53. On this passage and David’s oft-quoted comment about his “reading as if for life,” see Price, pp. 82-3. W.W. Greg, “Bibliography—An Apologia,” in Sir Walter Wilson Greg: A Collection of His Writings, ed. Joseph Rosenblum (Lanham, MD: Scarecrow Press, 1998). G. Thomas Tanselle has argued that these statements by Greg are often taken out of context, especially by McKenzie; see Tanselle, “The Work of D.F. McKenzie,” Papers of the Bibliographical Society of America, 98.4 (2004), 520. I agree with Tanselle to the extent that Greg’s statement shouldn’t be taken as a straightforward declaration of belief. Rather, if one reads Greg’s essay in full, it becomes clear that he is working through what he regards as a complex question, and that he leaves room for doubt (not unlike Price). But I also believe that McKenzie’s critique of bibliographical narrowness and positivism, even if it’s unfairly pinned on Greg — who, in his own way, was critiquing narrowness and positivism in that very same essay of 1932 — remains valid and necessary today. The resistance to interpretation has deep roots in the twentieth century. D.F. McKenzie, Bibliography and the Sociology of Texts (Cambridge University Press, 1999), p. 10. See the chapter “Intimations of (Im)materiality” in Johanna Drucker, SpecLab: Digital Aesthetics and Projects in Speculative Computing (University of Chicago Press, 2009). Great post, Alan! I enjoyed reading this far more than a typical scholarly essay or published book review. And, to think, anyone online can read it! But that’s another topic. What I like about Price’s book is that it enters into that space of thought that I suspect most people who love books don’t often want to contemplate. I’m thinking of my own experiences. I love reading. I still prefer books to e-readers, but fundamentally I spend more time transporting, arranging and rearranging, and protecting books than I do actually reading them. Books are great coasters for tea cups, for example. I often feel guilty or embarrassed admitting this, but I’m operating under the assumption that I’m not the only one here. I’m doing exactly what I shouldn’t, of course, in seeking out logical connections where there are none to be found, but I’m not sorry about it at all. It’s the way that books, material and represented, generate these badly-behaved epistemological boundaries that make me so excited about them in the first place. In Defence of Smaller Conferences: VSAWC 2015 in Kelowna BC, Canada.